The Hitachi CG22EASSLP string trimmer is a gas-powered lawn trimmer that is quite efficient in maintaining your field. For a long time, people who have been using it give a lot of positive feedback. It is gas-powered machine, and it’s easy to use. 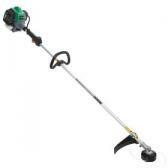 String Trimmer Reviews – This Hitachi cg22easslp line trimmer also has a semi-automatic cutting head. The semi-automatic cutting head of this trimmer dispenses the line as you need it while working in the garden and makes operating this product hassle-free. The 4-inch head of this gas line trimmer delivers a cutting swatch of 17 inches.